How to prep for high-moisture canola? Drying capacity of your current on-farm system. Cool air has a very low capacity to dry. Drying will not occur without heated air. If you don’t have capacity to dry canola as it comes off the field (aerating is a short-term solution for high-moisture canola), talk to local delivery points about possible early delivery. Accuracy of the on-farm moisture meters. Moisture testers are a valuable tool for harvest and storage decisions, including when to stop and start combining and when to stop drying. Charts that come with the Labtronics 919 don’t provide conversions for canola cooler than 11°C. The company has an Apple app that works with lower temperatures. (No Android version.) It also has a new automated Model 919 that reads well above 100 on the calibration scale. More information. Another option is the Grain Moisture app, which is available for Android. Propane supply. If the on-farm drying system uses propane, are the tanks full? If they’re not full, you may want to call around today to make sure you can get delivery in time. Will you share your dryer? If you have a dryer on the farm, will neighbours want to borrow it? As part of the preparation process, you might think how you’ll answer that question. Damp canola will store longer when cold, but this may not be as risk-free as one might think. Damp canola will have a lot of moisture in the seeds but also in the air between the seeds. As this moisture collects at the bottom of the bin, it can freeze canola into a solid block. 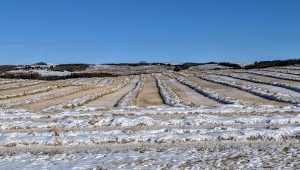 If outside air warms up (either later this fall or next spring), this bin becomes a volatile spoilage risk – but with the frozen block of canola at the bottom, you might encounter a real problem when quick action is required. You may want to move a load out of the bottom of that bin every day to prevent the bin-unload system from freezing up. Damp canola in a bag might be easier to get at, but bags may also warm up faster. With high moisture and warm air, canola can spoil within days. Read more. Monitor damp canola very closely. There is so much risk and so many dollars on the line. Under-fill the bin. The less depth to aerate, the better, because it is possible that spoilage could occur before the aeration front even reaches the peak of the bin. If using natural air drying for canola, fill the bin 1/4 to 1/2 full. With an October harvest, natural air drying may not occur because cool air has limited (or no) capacity to dry. Level the cone. A flat surface to the grain will improve airflow. Spreaders can also help to distribute chaff and fines which can allow for more even distribution of airflow. Turn the bulk frequently. Take out a load or two every day or every second day, especially high-moisture canola in aeration bins – even if using supplemental heat. Turning the bulk breaks up potential hot spots that have started to form, and will also help to even out the conditions in the bin. This also provides a chance for additional inspection. Natural gas, electric or propane heaters added before or after (after is better) the aeration fan can greatly improve air’s capacity to dry. Target a heater with output around 72,000 Btu/hour which is sufficient to heat air at 5,000 cubic feet per minute (cfm) by 10°C. To increase air temp by 10°C, that heater in combination with a 5,000 cfm fan will cost 50¢ to $3 per hour, depending on fuel type and efficiency of heat transfer system. 1. Air needs to be heated to more than 10°C to have good drying potential. Air below 5°C will have very little if any capacity to dry. 2. Only heat the air up to 15-20°C. With relatively low air-flow rates of aeration systems, it is important to only use warm air, not hot, to avoid ‘baking’ seeds closest to the fan. 3. Airflow of at least 0.75 cubic feet per minute per bushel is recommended for natural air drying with supplemental heat. (See below for more on how to estimate your fan’s airflow.) This is important. While airflow of 0.1 to 0.2 cfm/bu is adequate to cool a bin of canola, this airflow rate could actually put grain at greater risk if using supplemental heat. At low airflow rates, it could take a week or more to push the drying front all the way through a bin. That means a band of very high moisture air will take a day or so to work through each few feet of grain. Spoilage of tough or damp canola in warm temperatures can start within two days. 4. To estimate the required heater capacity for supplemental heating, multiply the desired temperature rise in degrees Celsius by the air-flow rate provided by the fan in cfm. Then multiply by 2.05. The result will be the heater capacity in Btu/hr. For example, for a target temperature rise of 10°C and an airflow of 5,000 cfm, the required heater capacity is 10 x 5,000 x 2.05 = 102,500 Btu/hr. 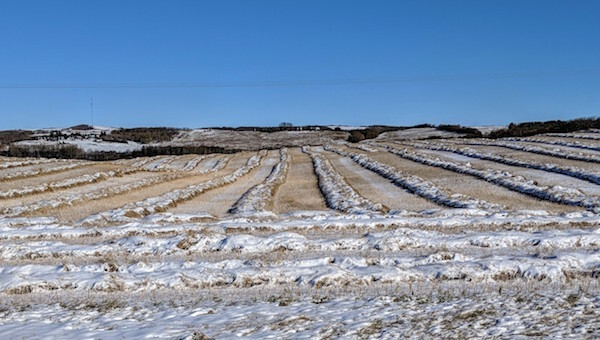 Although it is potentially possible to stabilize a bulk if the temperature is uniformly dropped to less than 5°C, drying canola now is better than waiting. Otherwise the bin will be unstable as soon as temperatures warm up, whether next spring or sometime this fall, and will need to be dried immediately. Read more: Tips for drying tough and damp canola. What if you have a plan for drying, but it means holding onto the grain in the meantime? The graph below is often referenced when trying to determine the number of ‘safe days’ producers have before spoilage begins. Be very cautious using these charts. This work was performed in small tubes, where the temperature and moisture conditions were uniform. Realistically, conditions are never totally uniform in a bin, and this is what precipitates the spoilage process. These charts should only act as a very rough guide. Assume much fewer safe days in the ‘real world’. Use these numbers with caution. They are based on test tube experiments (Burrell et al., 1980) without the variability found in most bins. If the fan already has a static pressure gauge, read the pressure (usually given in inches of water) when the fan is running and the bin is full (or is holding the amount of grain you want to condition or dry). Then find the fan curve chart for the make/model/size of the fan. Most fan manufacturers list these specs online. 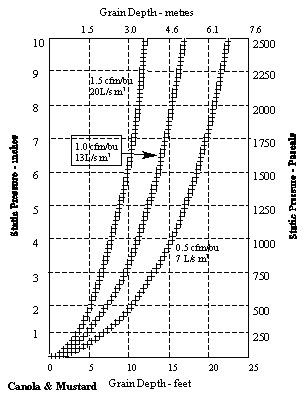 An example chart for low-speed centrifugal Chief fans is below. The last digits in the model number indicate the fan size in hp. Using this sample table, if the static pressure (or resistance to airflow) the fan is pushing against is 6″ of water and you have a 5 hp fan, the airflow rate will be 3,700 cubic feet per minute (cfm). 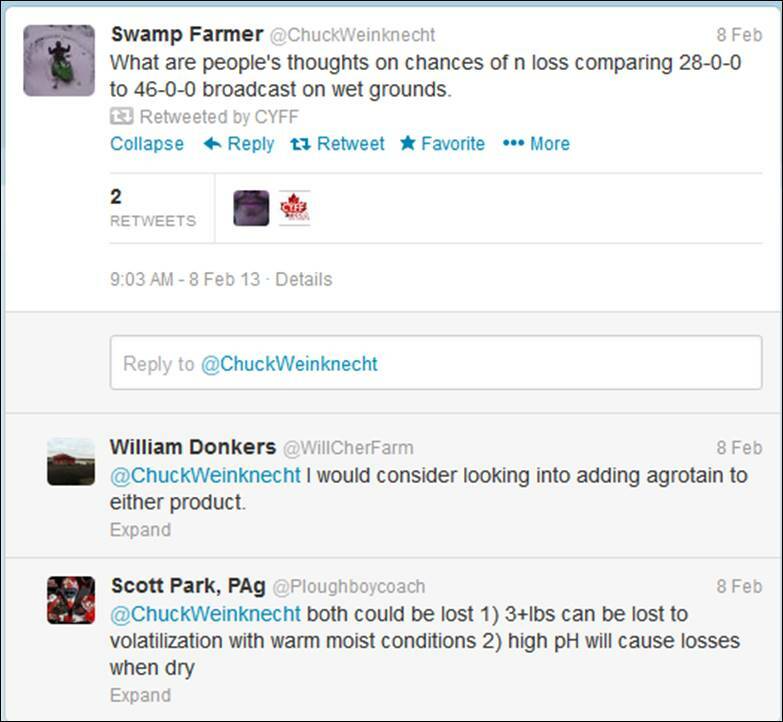 Then divide that number by the number of bushels in the bin to estimate the cfm/bu airflow rate. Propane charts: Btu/gal., pounds to gal, etc. Jay Whetter Country Guide article: Do you know how your aeration fan blows?